He turns 90 years young tomorrow. He’s in great shape. Today, he freaked me out when I noticed red drops all over his shirt and pants. I thought that he had cut himself, but it turned out to be paint (as per city regulations, the pipes that feed the his emergency sprinkler systems must be painted red). How many grandpas do you know are still climbing ladders in 100° heat to paint pipes that run across the ceiling? My grandpa rules! With the celebration in full swing and with all of my family in town, I haven’t been able to keep up with many of your wonderful blogs and comments as often as I would like. Many apologies to you all! I look forward to getting back to you soon! In the meanwhile, I hope that you will also have a wonderful, food-filled Wednesday! Is that family recipe/memoir book still coming? You did??? Oh gosh, John! I’m so sorry that it slipped my mind! The combination of the heat + my family has contributed to mental decline! Wonderful to read, and he looks amazing – really healthy. Does he steal your mother’s Creme De La Mer and smother his face in it as well? He does, doesn’t he? I’m not sure what grandpa’s beauty routine is. He does swear by a spoonful of apple cider vinegar a day . . . I might put up dinner photos 🙂 That’s a good idea! Hope it was a big success. I’ve heard of the wonders of apple cider vinegar for hair, but not daily ingestion. Hmm…I’m always one for natural health remedies, though! Adorable! Happy birthday to your grand-père. I’m coming up to 30 and I don’t climb ladders. Me neither! Partly because I don’t trust myself to not fall. The whole family came. We had a private room booked at a restaurant. Ate and drank so much. A bit hungover and comatose today from partying too hard with gramps! My dearest baconbiscuit. Your grandpa is as adorable as you described (a la Undina, perhaps he should get a treat?). Happy birthday to him and maybe he can accompany us to a sniffa when the weather is cooler? On behalf of my grandpa, thank you for the birthday wishes! Wow! He looks great for 90. Girl, look at that skin. You are swimming in a pretty good gene pool. He’s still climbing ladders too? I’m wishing him a happy birthday and I’ll have whatever he’s having. He’s obviously doing something right. Thank you, Poodle! Yes, he looks incredible for 90. He will outlive us all! He looks so hale and hearty… it must be the food and all that physical activity. Thank you so much, M. Dandy! We had a wonderful party and Grandpa was very happy! Happy birthday from Grandpa! I’m sending you best wishes filled with Whoopie pies and lobster rolls from Maine! Oops! It should have read happy birthday TO Grandpa! Geez! I’m only 42 and my language skills are already slipping! How did he make it to 90 and still look so darn good? Thank you, heidiskye333! We had a wonderful evening! Wait. How did this reply get stuck here at the end . . . Your grandpa sounds like a real character! I hope I can visit him one day. He is! I hope you get to meet him some day too! Thank you, Kay! I hope so too! Here’s to many more with Grandpa! How sweet is that? 🙂 Happy birthday! Many dim sum meals in the year ahead! Thank you, Michelle! Yes, here’s to many more dim sum Sundays! Happy Birthday to Grandpa! Make him eat some expensive dim sum! Thank you, Steve! Yes, the food where we go is not actually cold anymore, but I wouldn’t call it hot either. Maybe if I lied to grandpa about the cost we could get him to switch restaurants. I’m sure! My grandpa loved having a whole day devoted to him. At that age, you should have a ton of attention! Happy early birthday to your grandmother! You’re right! Keep feeding him love 🙂 thank you!! I know his day had to be very special…Happy Birthday and may he have many more healthy ones. Thank you, Karen! It was a great day full of family, good food, and lots of wine. Here’s to many more! I want to join others in sending the best wishes to your grandfather. 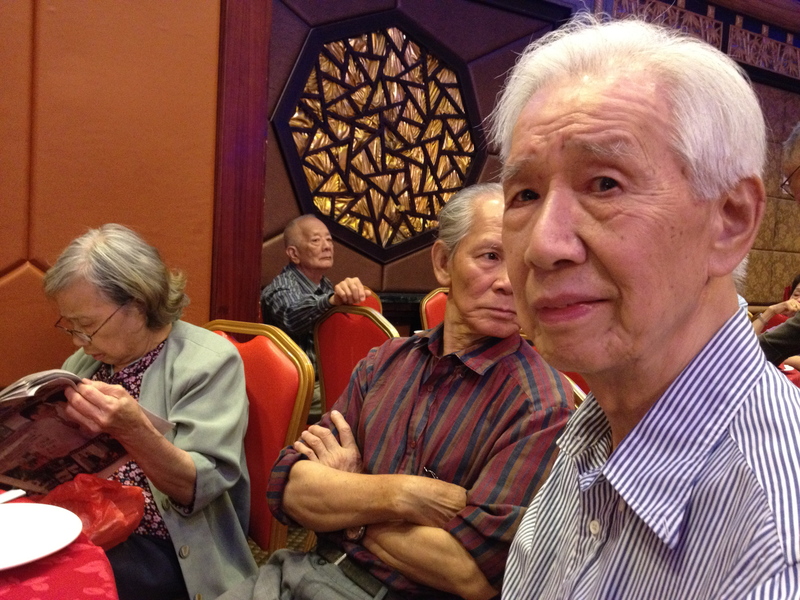 I have only one grandparent left – my 92 y.o. Grandma and I hope she’ll be with us many years. Thank you so much, Undina! We had a wonderful celebration and are looking forward to next year’s birthday 🙂 Here’s to many more years! Happy birthday to your grandfather! 90 is definitely a milestone age. He still looks young, healthy, and vibrant! Thank you, Dienna! He is certainly still very fit and dapper. Here’s to many more milestones!